A family group of travellers from Liverpool have hit the headlines in New Zealand. Watch the local news report here. Etihad claims to have made the world’s first commercial flight – on a Dreamliner from Abu Dhabi to Amsterdam – using locally-produced sustainable fuel. Watch here. AeroMexico is trolling Americans with a spoof ad offering discounts based on how much Mexican DNA they have in their bodies. Watch here. Delta Air Lines’ CEO said the US government shutdown cost the airline $25m this month. Watch here. Tourism name-checks Taylor Swift as it showcases Ireland’s castles. Watch here. In the biggest airline event of the year so far, Aer Lingus unveiled its (already leaked on social media) new brand. Security was TSA-like, with laptops out and shoes off, at Hangar 6 as approximately 500 guests counted down to the brand refresh. 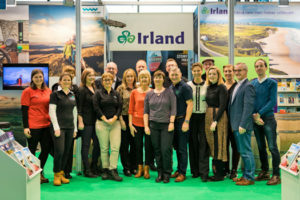 The travel trade was well represented, with tour operators mingling with airline executives, including former CEO Stephen Kavanagh, and Tourism Ireland CEO Niall Gibbons at the event. 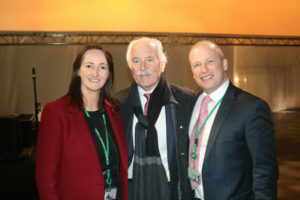 Jenny Rafter and Ivan Beacomb of Aer Lingus are pictured with ITAA President John Spollen at the rebrand reveal, Hangar 6. See more pictures here or connect to the album on Facebook. Full story on the rebrand here. So what of the new look? The reaction has been mixed, with social media bemoaning the lack of green, claiming that the new mostly white look resembles sister IAG airlines Iberia or Level. And some airline insiders have questioned the low figure – just €2m – being bandied about regarding the rebrand’s cost. Travel Extra grabbed a shot of the first aircraft in the new branding – St Maincín, which stood out from its green sisters as it prepared for its first to New York JFK, where a reception awaited. Aer Lingus will be saving on the green paint after a rebrand which Travel Extra has publicly likened to a hand-me-down version of Iberia’s rebrand last year. Aer Lingus aircraft will no longer have the distinctive look that differentiates them from the lookalike whites at airports internationally. See more aircraft pictures here or connect to the album on Facebook. The media pack were only interested in one thing: the B word. 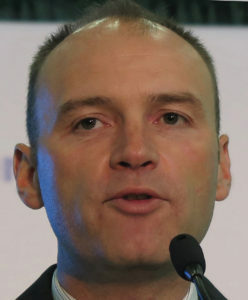 New CEO Sean Doyle said Aer Lingus flights will not be grounded by Brexit after March 29 even if Britain quits the European Union without an agreement. He’s pictured with First Officer Laura Bennett, who pilots Airbus A320s on European routes, at the event. Aer Lingus rebrands are few and far between. The current scheme has been in place since 1996 and the previous one dated to 1974. Ryanair has cut its full-year guidance, expecting profits (excluding Lauda) to be “only” in the €1bn-€1.1bn range, not the €1.1bn-€1.2bn. CEO Michael O’Leary said fares were 7pc down last winter, but came out fighting: “While we are disappointed at this slightly lower full year guidance, the fact that it is the direct result of lower than expected H2 air fares, offset by stronger than expected traffic growth, a better than expected performance on unit cost and ancillary sales is positive for the medium term.” And he pointed fingers elsewhere: “There is short haul over-capacity in Europe this winter, but Ryanair continues to pursue our price passive/load factor active strategy to the benefit of our customers who are enjoying record lower air fares. We believe this lower fare environment will continue to shake out more loss making competitors, with WOW, Flybe, and reportedly Germania for example, all currently for sale.” The airline had originally forecast profits of €1.25 bn to €1.35 bn before October’s profit warning took account of a series of strikes across Europe during the summer that hit traffic and bookings, but have since subsided. 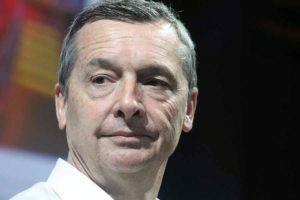 The new range would represent a 24-31% fall from the record €1.45 bn post-tax profit Ryanair booked in its most recent financial year. See Ryanair statement here. Travel Extra‘s Eoghan Corry here. Holiday World Belfast opened its doors on Friday to three days of excitement, led by Sandra Corkin’s Oasis Travel cruise session, Delia Aston’s Clubworld, the biggest Spanish pavilion in some time and a larger than usual delegations from USA and Canada. The good weather in Belfast brought out record crowds, up 4pc on 2018 after two days, with Oasis Travel, Clubworld, Barrhead Travel and Jet2 reported sales in excess of expectations. 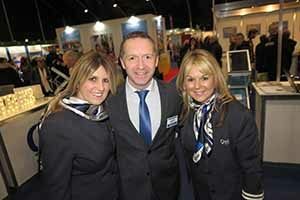 Picture shows Alison Hamilton, Brendan Mallon and Sandra Corkin of Oasis Travel at the show. Watch here video diary of the event. See more pictures here or connect with the album on Facebook. 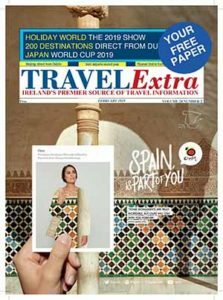 The Holiday World consumer issue of Travel Extra will be available in the coming days with destinations reviews from five continents across the entire travel portfolio and news updates on holidays, cruise, ferry, aviation, data and intelligence. See online here. Dublin Airport issued a notice on the Government’s e-tenders site to inform potential bidders for €1bn worth of work due to be completed in the early years of the next decade and to help it identify businesses with the scale and experience required. Along with adding the extra gates and stands, DAA wants to complete about €150m worth of work on its airfield and €50m in T1 and T2 by 2024. Dublin Airport intends to hold briefing sessions for potential candidates in Dublin, London, Paris and Madrid later this month and in early February, including one for members of builders’ representative body, the Construction Industry Federation. Donna Kenny from Cassidy Travel is this year’s winner of a hybrid car in the Blue Insurance and Toyota Sandyford win a car competition. Saba restaurant in Dublin was bustling with trade pals as the finalists vied for the prize. 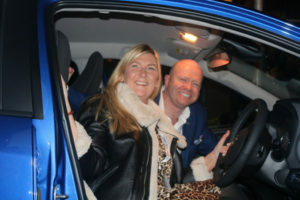 Donna is pictured with Ciaran Mulligan from Blue Insurance as she tries out her new car on Dublin’s Clarendon Street. See more pictures here or connect to the album on Facebook. For a full video of the night’s car countdown drama, watch here. Ciaran Mulligan thanked the trade for their support throughout the year, and making the car competition a success. Watch here. The race is on for the 2018 Irish Travel Industry Awards, with the hotly contested supplier category short list contested by Brian Hughes of United, Rebecca Kelly, of MSC Lee Osborne of Bookabed, Martin Penrose of Ifonly and Jeanette Taylor of Sunway. Rebecca is departing MSC for Princess in the coming weeks, so interesting days head. see the full shortlist at the end of the bulletin. 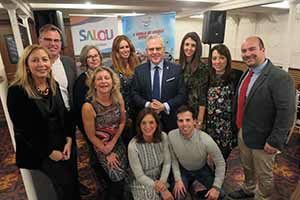 Paco Gutierrez of the Spanish Tourist Board in London, Pere Granados Mayor of Salou and a team of representatives from Spain hosted 27 media and 60 trade at separate events on board SS Nomadic in Belfast on the even of Belfast Holiday World. Kristian Kamplade of Murcia Tourism, Pere Granados Mayor of Salou, who is seeking re-election on May 26 and Carlota Farrial of Portaventura, who wore the most talked about dress of the evening (bought in Belfast) spoke at the events. Picture shows Natalia Bel of Salou Tourism, Kristian Kamplade of Murcia Tourism, Rosa Ferrer of Castellon, Carlota Farrial of Portaventura, Pere Granados Mayor of Salou, Ana Bermudez of the Spanish Tourist Board in London, Arminda De Leon of Lanzarote Tourism, Paco Gutierrez of the Spanish Tourist Board in London. Front row: Juana Rosa Aleman of Gran Canariua, Ainho Cobo of Andalucia Tourism and Jose Alberto Prior of Murcia Tourism. Watch here video diary of the event. See more pictures here or connect with the album on Facebook. 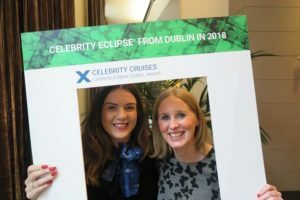 Celebrity Cruises is looking to hire a head of sales for Ireland and Scotland following the promotion of Mandy Burrie, well known to the trade – at the line, reporting to Nicola McNeish, both of whom are pictured on right. Full story here. The Fitzwilliam Hotel St. Stephen’s Green is the venue for Skål Dublin club’s first vent of 2019, Tuesday February 12th @12.30 where Skålleague Fergal O’Connell is looking forward to welcoming members & guests, €35.00 per person. Datalex shares fell as the Dublin-based travel software firm said it expects a loss of between $1m – $4m (€872,000 – €3.5m) this year. Congratulations to Karen Maloney, Leisure Sales Manager at Etihad Airways, who is celebrating 39 years in the travel industry this weekend. Travel agents and operators could be forgiven for feeling a touch of schadenfreude as Ryanair showed that selling packages is not as easy as it thought, and shut its Ryanair Holidays division. Full story here. Uniworld Boutique River Cruises is gearing up for the launch of its latest luxury ship, SS Bon Voyage, which will be plying the waters of France this year. The Travel Corporation’s Sharon Jordan updated the media and writers at Dax in Dublin on the new vessel. TTC’s Marissa Beck, Sharon Jordan and Brian Hynes are pictured at the event. See more pictures here or connect with the album on Facebook. The Amazing Thailand Road Show in Dublin on February 27 has been booked out with 30 people on the wait list. There are 20 spaces left at Galway on February 28, and spaces available for Scottish agents in Glasgow (March 20) and English agents in Liverpool (March 21), Bournemouth (April 10) and Brighton (April 11). 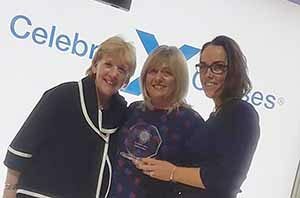 Picture shows Jo Rzymowska of Celebrity Cruises presenting the consortium award to Carol Anne O’Neill of Worldchoice and Caroline O’Toole of Fahy Travel at the Celebrity Cruise awards in London on Thursday. 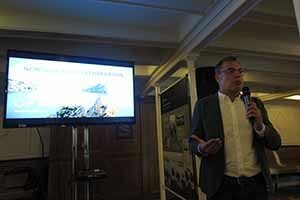 Other Irish winners were Trailfinders and Oasis Travel. Housing allocation and places for tours and post-fams has opened for IPW 2019 June 3-7 in Anaheim. 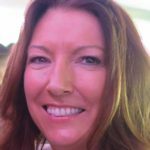 US Travel’s press officer Cathy Reynolds will be a guest of Visit USA in Dublin this week. Wendy Wu Tour now are offering £200pp off group tours. Video diary of trip to Borovets with Peter McMinn, Julie Magill, Roberto Comsa, Nevy Petkova and Ivaylo “Romeo“ Valnarov of Travel Solutions watch here. Japan’s Henn na “Strange” Hotel has decomissioned half of its 243 robot staff for being not very good at their jobs. Notable examples include a robot velociraptor who checks guests in. A pilot has asked a judge to dismiss an ‘outrageous’ indecent exposure charge against him, after his arrest for standing naked in front of his hotel window overlooking the Denver International Airport terminal. 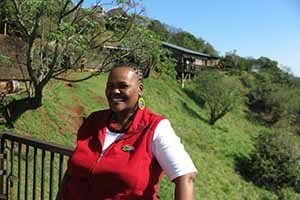 South African Tourism launched its campaign: ‘Meet Your South Africa’ (website and video), to showcase experiences delivered by charismatic local guides. One of these, Thoko Jili from KZN, will be speaking at Holiday World in Dublin next week. The DFA have upgraded the advice in Kenya to a high degree of caution after the attack on the Dusit D2 Hotel in Nairobi. A previous attack on the Westgate centre resulted in the death of Mbugua Mwangi, son of Kenya’s former ambassador to Ireland Catherine Muigai Mwangi. The six countries that scored the highest marks for Best Climate in the World in the Annual Global Retirement Index 2019 are 1 Ecuador, 2 Costa Rica, 3 Colombia, J4 Mexico, Pero and Portugal. Portugal is planning dedicated corridors at Faro and Funchal airports to allow fast-track access for British tourists after Brexit. Elliott Ferguson, CEO of Destination DC said Washington is still for business as a destination, despite the US government shutdown causing museum closures. Zimbabwe‘s DMCs assured partners that all of their camps and lodges are operating as usual and that their business has not been affected by the current activity happening in Zimbabwe, as the DFA raised the advisory on travel to Zimbabwe to a high degree of caution. Amsterdam’s Red Light district is suffering a downturn in trade – with tourists more interested in blocking windows to take selfies rather than have a liaison. Rome’s mayor has backtracked on controversial plans to take the coins tossed into the Trevi Fountain by tourists from a Catholic charity and put them in council control. Tickets are now on sale for the IAAF World Athletics Championship in Doha 2019 from a contact person at IAAF for tour operators with booking options for foreign tour operators information online on https://www.iaaf.org/tickets & here. In a major victory for Irish businessman Pat McDonagh, McDonald’s has lost its European trademark battle with his Supermac’s brand. Drumshanbo Gunpowder Irish Gin, Galway Gin and Glendalough Gin are to be listed for sale by the Liquor Control Board of Ontario, which retails and distributes booze in Ontario, Canada. 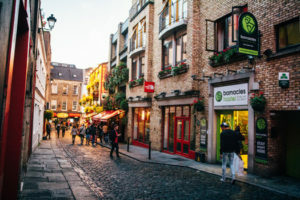 Irish-owned theKeycollections, which currently operates five hotels and three guesthouses in Dublin, has signed a 25 year lease to operate Barnacles, a 171-bed hostel in Temple Bar. Dublin’s five-star Conrad Hotel is on the market with a guide price of over €115m. PREM Group launched Sprint Digital, a website design and digital marketing services company. Ireland’s second largest largest hotel group, Tifco, has reported that pre-tax profits rose four-fold to €11.89m in 2017 following the acquisition of 13 Travelodge hotels in Ireland. Ryanair is in partnership with guest accommodation platform SiteMinder to provide European hotels direct access to sell their properties on Ryanair Rooms. Consultants Crowe predict up to 3,000 hotel rooms could be opened in Dublin by 2023 in addition to the 699 rooms planned. BLESS Hotel Madrid opened its doors to guests, the first to open under the new luxury hotel brand, BLESS Collection Hotels, from Palladium Hotel Group. Aviation financiers descend on Dublin this week for two rival annual conferences, the Airfinance Journal conference at the Convention Centre on January 22-24 and the Growth Frontiers Conference at the Shelbourne Hotel January 20th-23rd with the Aviation 100 Global Leaders Awards on January 21 at the Clayton Hotel, Burlington Road. Speakers at Air Finance include Domhnal Slattery, Gus Kelly, Hugh Flynn, Declan Ryan, Patrick Hannigan, Stephen Kavanagh, John Leahy, Norm Liu and Daniel Roeska. Speakers at Growth Finance include Howard Millar, Steven Udvar-Hazy, Gus Kelly (again), Ben Hughes, Ben Ferguson and John Meakin. A busy week for airheads starts this evening with the Aviation Club dinner where Willie Walsh will be honoured. Dublin Airport’s year-end figure for 2018 was 31,495,506, of which 2.1m were transfer passengers (who were double counted, 1.05m bodies). 1m were transfer passengers (who were double counted, 1.05m bodies). Europe is up 7pc, Britain up 1pc, trans-Atlantic up 16pc and Asia, middle east and Africa up 17pc. New Aer Lingus CEO Sean Doyle said the Flybe takeover is in “very early stages“. 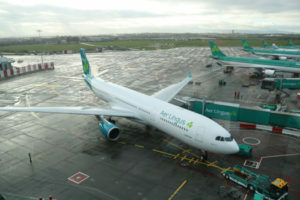 He insisted that Aer Lingus Regional worked for the IAG-owned carrier, and that it is “very committed” to retaining Aer Lingus Regional as a franchise operation. Final completion on the sale of Flybe to the Virgin Atlantic / Stobart Group consortium Connect Airways is expected by February 22. Lippincott, the creative consultancy leading the Aer Lingus brand refresh project said lead designer on the project was Dubliner Brendán Murphy, educated at NCAD and St Benildus College, Kilmacud, Dublin, before going to the US. A Ryanair flight from East Midlands was the first flight to arrive at the new Airport of Corvera, which replaces the civil use of San Javier as the airport for Murcia. Picture shows Kristian Kamplade of Murcia Tourism speaking to Irish Travel trade about the new airport, which will handle flights from Dublin. Ryanair announced Shannon-Frankfurt from May. 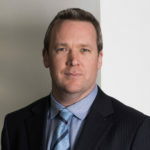 KPMG’s Aviation Industry Leaders Report 2019 estimated 50pc of the world’s leased fleet is owned or managed from Ireland by 50 lessors with Irish operations, with 4 of the top 5 lessors originating their businesses here. KPMG says the industry cycle has peaked and is tapering back from the very high growth rate of recent years. BA World Traveller Plus customers will see new furnishings, an enhanced service and an improved dining experience as part of the airline’s £6.5bn investment plan with new menus available from February 1, a third main meal option, a more substantial hot second meal later in the flight followed by new amenity kits, quilts and pillows. Finnair are to fly Helsinki-Sapporo 2w seasonal as their fifth Japanese destination, with AA330-300 from December 15, and become the first European carrier to serve Hokkaido since KLM ended service in January 2002. W-pattern pilgrimage fans will be interested in Ryanair’s new Lisbon –Lourdes route from April. Higher costs are putting a squeeze on airline profits, IATA warned, with capacity rises of 6.8pc outstripping passenger demand. IATA warned that the decision of Westminster MPs to reject the Britain-EU Brexit agreement could lead to a cap on flights post March. Cork-born Stansted Airport CEO Ken O’Toole argues that many “don’t have a clue what airlines want”, and talks of the vital €675m expansion at his crowded airport. Aer Lingus says it is committed to its franchise arrangement with Stobart Air for Aer Lingus Regional services. Norwegian tells Travel Extra that US base closures will not impact flights from Ireland. Cuts at Norwegian mean that all routes out of Providence with the exception of Dublin will be cancelled this year. Hainan briefly put a 2w service from Dublin to Shenzen on its website, starting February 25, and then quickly removed it. The DAA has lodged an appeal to An Bord Pleanála against a €10m housing development which is planned for a site inside the Inner Airport Noise Zone in Dublin. TUI are pulling services from Derry in 2019 due to low demand, and say those who had booked have been rebooked at no extra charge on a Belfast flight the next day. APH reported priority boarders now accounting for more than half of the total passengers on board Ryanair flights. Lufthansa CEO Carsten Spohr has changed his mind and now wants Berlin-Tegel airport to remain open when the new Berlin-Brandenburg eventually opens and he wants Tegel updated. Ryanair announced a tenth Moroccan airport, Tetouan, with 2w round trips to Malaga from April. Iberia relaunched its new corporate website, http://grupo.iberia.es, with a more modern, fresh, and intuitive design, providing exhaustive information about the company, its business, history, magnitudes, values, and philosophy. AerCap announced the delivery of a new Boeing 787-9 Dreamliner on long-term lease to EL AL making it the world’s largest lessor of the Boeing 787 Dreamliner, with 117 aircraft owned, managed and on order. With the Commission of Aviation Regulation wanting Irish tour operators not to use English airlines for charter work post-Brexit, Spanish based AlbaStar and Air Europa have been taking over contracts operated by the defunct Birmingham operator Cello. Air Transat is offering Dublin to Canada from €297 return. Ian Hyland’s tribute to Herb Kelleher. Royal Caribbean is in the process of acquiring land for additional Perfect Day private islands, said president Michael Bayley. MSC Cruises will be offering the option of renting a smaller, private island next to its new Ocean Cay MSC Marine Reserve in the Bahamas, which opens next November. Royal Caribbean is offering free onboard wifi as par of its WAVE sales on selected sailings for bookings made before Tuesday, January 22. Rosslare Port told RTE’s Morning Ireland that it is in discussions with alternative ferry companies following the loss of the Irish Ferries service to France. Listen here. Newgrange Interpretive Centre is to close for six months for renovation, during which entry will be free and through portacabins on a first come first served basis. Loughcrew will not be open for the spring equinox. City Breaks: 1 New York; 2 Rome; 3 Paris; 4 Barcelona; 5 London. International Destinations: 1 Italy; 2 Spain; 3 Portugal; 4 France; 5 Canary Islands; 6 Croatia; 7 Greece; 8 Thailand; 9 Iceland; 10 Australia. Irish Destinations; 1. Kerry; 2. Galway; 3. Cork;4. Wexford; 5. Donegal; 6. Westport; 7. Clare; 8. Dublin; 9. Kilkenny; 10. Waterford. Irish beaches: 1 Curracloe, Co Wexford; 2 Inch, Co Kerry; 3 Inchydoney, Co Cork; 4 Brittas Bay, Co Wicklow; 5 Keem Bay, Co Mayo; 6 Ballybunion, Co Kerry; 7 Enniscrone, Co Sligo; 8 Tramore, Co Waterford; 9 Portmarnock, Dublin; 10 Dog’s Bay, Co Galway. National attractions:1 Cliffs of Moher; 2 Guinness Storehouse; 3 Dublin Zoo; 4 Tayto Park; 5 Newgrange; 6 Glendalough; 7 Giant’s Causeway; 8 Kilmainham Gaol; 9 Spike Island; 10 Bunratty Castle. Local attractions: 1 Phoenix Park; 2 Glendalough; 3 Malahide Castle; 4 Kilkenny Castle; 5 Marlay Park; 6 National Gallery; 7 Wells House; 8 Botanic Gardens; 9 Little Museum of Dublin; 10 Hook Lighthouse. Adventures: 1 Waterford Greenway; 2 Bray to Greystones Cliff Walk,; 3 Lough Key Forest Park, Co Roscommon; 4 Howth Cliff Walk, Co Dublin; 5 Castlecomer Adventure Park, Co Kilkenny. Hotels: 1 Shelbourne Hotel, Dublin; 2 Monart Spa, Co Wexford; 3 The Europe, Co Kerry; 4 Ashford Castle, Co Mayo; 5 Kelly’s Hotel, Co Wexford; 6 Adare Manor, Co Limerick; 7 Powerscourt Hotel, Co Wicklow; 8 Cliff House Ardmore, Co Waterford; 9 Harvey’s Point, Co Donegal; 10 Amber Springs, Co Wexford; . Spas: 1 Monart, Co Wexford; 2 Seafield, Co Wexford; 3 ESPA at The Europe, Co Kerry; 4 Farnham Estate, Co Cavan; 5 Fota Island Resort, Co Cork; 6 Galgorm Resort & Spa, Co Antrim; . Small Stays: 1 Hidden Valley, Co Wicklow; 2 Castlewood House, Co Kerry; 3 Aldridge Lodge, Co Wexford; 4 Dunowen House, Co Cork; 5 MacNean House, Co Cavan; 6 Finn Lough, Co Fermanagh. Seven in 10 tourism businesses say Brexit is their number one concern in the latest Tourism Industry Barometer by Fáilte Ireland. The organisation is investing €5m to support the sector as it prepares for Brexit. National Museum figures for 2018 show Kildare Street down 2pc to 466,038, Merrion Street up 3pc to 345,513, Collins Barracks down 15pc to 198,974 (down 52pc from their 1916-2016 centenary peak) and Turlough Park up 9pc to 116,206. ITIC chief executive Eoghan O’Mara Walsh has warned of the dangers of a no-deal Brexit, saying it would be the worst outcome for Irish tourism — sterling would likely fall thereby reducing Irish competitiveness. Waterways Ireland and Fáilte Ireland have a fund of up to €50,000 to study to assess the tourism potential of two routes that link the Royal Canal and Grand Canal. 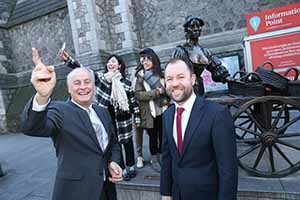 Tourism Ireland has issued a tender for public relation services in Britain to push the island among the British market. Willlie Walsh will receive the contribution to the industry award at the inbound Irish Tourism Industry Awards (the other ITIA’s), at the Clayton Ballsbridge Saturday February 1. Clare launched a Festivals and Events Guide 2019. Doreen McKenzie, formerly of Knock travel, reports that the initiative to establish the Northern Ireland Tourism Alliance, a northern version of ITIC, have been a resounding success over the past six months. Belfast tour guides Dee Morgan, Ruairi Ó hÉara and Mark Rodgers have combined their 30 years of experience and six premier tour guide companies to form a new one stop shop for DMCs and tour companies, LuxuryNItourguides. The 2019 foodies season in The Burren will commence with the Burren Slow Food Festival, taking place from the 10th to the 12th of May in Lisdoonvarna. Discover Ballyshannon Tourism Partnership launched their new brochure, town map and website. Insight Vacations offers: Enchanting Canyonlands escorted tour, 7 days visiting Scottsdale, Grand Canyon, Lake Powell, Bryce Canyon, Zion National Park and Las Vegas, including flights, transfers, and 6 nights’ accommodation in central locations, was €2,979pps, now from €2,749pps. Flight cost must be paid at the time of booking. Book and pay in full by February 28, 2019, depart August 20. www.insightvacations.com or call 01 775 3803. Uniworld Boutique River Cruises offers: Brilliant Bordeaux river cruise, 8 days visiting France, now from €2,249pps, including flights, airport transfers, all meals and beverages, all shore excursions and 7 nights in a classic stateroom on board the SS Bon Voyage. Flight cost must be paid at the time of booking. Port charges not included. Book and pay in full by March 31, depart May 19. www.uniworld.com or call 01 775 3803. 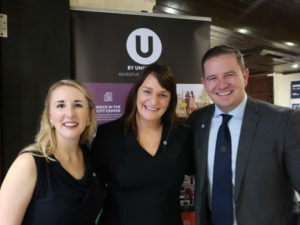 ITIA supplier rep short list 2019, Brian Hughes of United, Rebecca Kelly, of MSC Lee Osborne of Bookabed, Martin Penrose of Ifonly and Jeanette Taylor of Sunway. Accommodation Only: Arrow Tours; Bedsonline; Bookabed; Globe Hotels; Innstant Travel. Previous winners: 2011-2-3-4. Bookabed, 2015 Lowcost, 2016-8 Bookabed. Airline to Europe: Aer Lingus; Lufthansa; Ryanair; SAS; Turkish Airlines. Previous winners: 2011-2-3-4-5-6-8 Aer Lingus. Airline to Europe Business Class: British Airways; KLM; Lufthansa; SAS; Turkish Airlines. Previous winners: 2015-6 BA, 2017-8 Turkish. Airline to N America: Aer Lingus; Air Canada; American Airlines; Delta Airlines; United Airlines. Previous winners: 2011-2 Aer Lingus 2012-3-4 United, 2015-6-7-8 Aer Lingus. Car Hire: Affordable Car Hire; Avis; Flexible Car Hire; Hertz; Your Car Hire. Previous winners: 2011-2-3 Holliday Autos, 2014-5-6-7-8 Hertz. City Europe: Amsterdam; Barcelona; Krakow; Lisbon; Madrid. Previous winners: 2011 Barcelona/Paris, 2013-4-5-6-7-8 Barcelona. City Worldwide:Dubai; Hong Kong; Las Vegas; New York; Toronto. Previous winners: 2011-2-3-4-5-6-7-8 New York. Cruise: Carnival Cruises; MSC; NCL; Princess; Royal Caribbean. Previous winners: 2011-2-3-4-5-6-7 Royal Caribbean. 2018 MSC. Cruise Premium: Celebrity; Cunard; MSC; Oceania; Royal Caribbean. 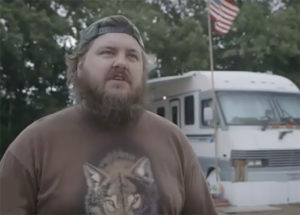 Previous winners: 2018 Celebrity. Cruise Specialist: Ama Waterways; Avalon Waterways; Riviera; Uniworld; Viking. Previous winners: 2013-4-5-6-7-8 Uniworld. 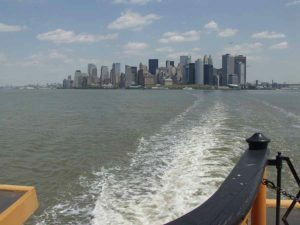 Cruise Ultra: Azamara; Celebrity; NCL; Seabourn; Silversea. Previous winners: 2011-2 Celebrity, 2013-4 Silversea; 2015 Celebrity, 2016-7-8 Silversea. 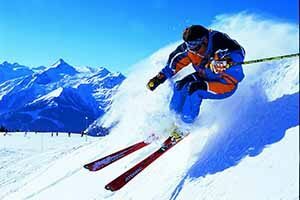 Destination Ski: Austria; Andorra; France; Italy; Bulgaria. Previous winners: 2011-2-4-5-6-7 Austria (no award 2013 & 2018). Destination Summer: Italy; Greece; Lanzarote; Portugal; Spain. Previous winners: 2011-2 Algarve, 2013-4-5-6 Spain, 2017-8 Portugal. Destination Winter: Dubai; Gran Canaria; Lanzarote; Las Vegas; Tenerife. Previous winners: 2011-2-3-4-5-6-7-8 Lanzarote. Ferry Company: Brittany; Irish Ferries; P&O; Stena Line. Previous winners: 2011-2-3-4-5-6-7-8 Irish Ferries. 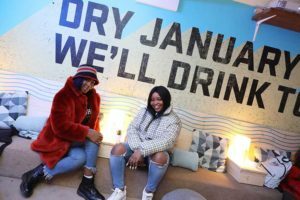 Marketing Campaign Agency: Click & Go, Tour America. Previous winners: 2011 FCm, 2012 Shandon Travel, 2015 Tour America, 2016 Clickandgo, 2017 Tour America. 2018 Grenham Travel (no award in 2013-4). Marketing Campaign Shopfront:: J Barter Travel Group; Tour America; ClickandGo. Previous winners: 2018 Cassidy Travel. Supplier Support Team: Aer Lingus; Amadeus; Bookabed; MSC; Sunway. Previous winners: 2011-2-3-4 Amadeus, 2015-6 MSC, 2017 Bookabed, 2018 MSC. Supplier promoting travel agents to the public: Shortlisted: MSC Cruises; Royal Caribbean; Sunway; The Travel Corporation; Wendy Wu. New category. Tech Provider: Amadeus; Dolphin Dynamics; Proactive Labs; Travelport. Previous winners: 2011-2-3-4-5-6-7-8 Amadeus. Theme Park: Disneyland Paris; Portaventura; Siam Park; Universal Orlando; Walt Disney Orlando. Previous winners: 2013-4-5-6-7-8 Universal Orlando. Tour Op Escorted: G Adventures; Insight Vacations; Riviera Travel; Sunway; Wendy Wu. Previous winners: 2013-4-5-6-7 Insight Vacations, 2018 Wendy Wu. Tour Op European Sun: Classic Collection; Sunway; Topflight; TUI. Previous winners: 2011 Sunworld, 2012 Thomas Cook, 2013-4-5-6-7-8 Sunway. Tour Op Long Haul: Classic Resorts; If Only; Sunway; Travel Focus; Wendy Wu. Previous winners: 2011 Sunway, 2012 Classic Resorts/Sunway, 2013 Classic Resorts, 2014-5 Sunway; 2016 Classic Resorts, 2017 Sunway, 2018 Classic Resorts. Tour Op Specialist: G Adventures; If Only; Sunway; Travel Focus; Wendy Wu. Previous winners: 2011-2 Discover Travel, 2013 Classic Resorts, 2014 Insight; 2015 Sunway, 2016 Insight, 2017 Sunway, 2018 G Adventures. Tourist Board: Las Vegas; New York; Portugal; Spain; South Africa. Previous winners: 2012-3-4-5-6-7-8 Spain. Travel Agency <10: Travelagent.Ie; Galvins Travel; Corrib Travel; O’Hanrahan Travel; O’Donohoe Travel; The Travel Broker. Previous winners: 2015 Navan Travel, 2016 Fahy Travel Galway, 2017 Grenham Travel Athlone, 2018 Manning Travel Kilkenny. Travel Agency >10: Frosch Ctm; Cassidy Travel; Click&Go; Tour America. Previous winners: 2011 Lee Travel, 2012 Tour America, 2013 O’Hanrahan Travel, 2014 Lee Travel, 2015 Club Travel, 2016 Cassidy Travel, 2017 Shandon Travel, 2018 Tour America. Travel Agency CorporateAtlas Travel; Corporate Travel.Ie; Club Travel HRG; Fcm; CWT. Previous winners: 2011 CWT, 2012-3-4 FCm, 2015-6 Atlas, 2017 CWT, 2018 HRG. Travel Insurance: Accident & General; AIG; AXA Insurance; Blue Insurance; Worldwide Insurance. Previous winners: 2011 Accident & General, 2012-3-4-5-6-7-8 Blue Insurance. Travel ProfessionalCorporate: Previous winners: 2013 Rhona McCannof FCm, 2014 Lelia Gregoryof CWT; 2015 Catherine Monaghan of FCm, 2016Karen Gleeson of FCm, 2017 Niamh Gleeson of FCm, 2018 Louise Dunne & Karen Ray (Job Share) of The Travel Broker. Travel Professional Leisure: Previous winners: 2013 Katrina McMullan of Navan Travel & Clare O’Dwyer of Shandon travel, 2014 Christine Rickard of Tour America & Katrina McMullan of Navan Travel; (2 categories), 2015 Louise Brennan Ormsby of Club Travel, 2016 Liz Wright of Tour America, 2017 Sandra Mooney of Cassidy Travel, 2018 Joanna Gomez of Travel Focus.